In 1957, Australian television was little over a year old when the country’s first dedicated TV magazine, TV-Radio Week, was launched. The publication was launched in association with Melbourne’s GTV Channel 9 who were looking for a print media outlet to promote their programs. Their main commercial rival, HSV7, was well served through its sister stable of newspapers The Sun News Pictorial, The Herald and the weekly radio and television paper Listener In-TV, but since the demise of the daily newspaper The Argus in 1957, GTV9 had few promotional opportunities in the print media. 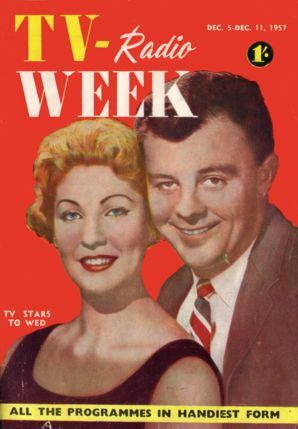 The first issue of TV-Radio Week was dated 5 December 1957 and was sold only in Melbourne (at that stage, television only existed in Melbourne and Sydney) with GTV9 personalities Geoff Corke and Val Ruff on the front cover. The pocket-sized magazine sold for one shilling and included program listings for both TV and radio. By 1958, the first Sydney edition was published and the name was abbreviated to TV Week. 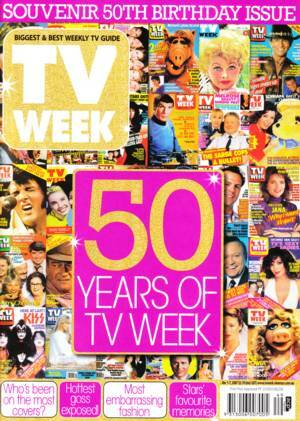 Later in the same year, the magazine invited its Melbourne readers to vote for their favourite personalities and programs for the inaugural TV Week Awards. The winner of the first “Star Of The Year” award was In Melbourne Tonight host Graham Kennedy who went on to name the awards the Logies. The Sydney launch of TV Week came as another TV magazine, TV News, was being launched locally by the ABC. TV News, then TV News-Times and later TV Times, expanded into Melbourne with the launch of a local edition in August 1959. TV Week and TV Times would go on to compete against each other for over 20 years. TV Week continued to expand across the country as television itself expanded into new territories. The first Queensland and South Australian editions were published in 1959. Tasmania followed in 1960, and Western Australia in 1961. In 1968, TV Week transformed itself from a pocket-sized magazine to the current-day A4 size which would bring it inline with its rival TV Times and other weekly magazines in the market. The new format resulted in a boost to circulation. The magazine continued through the 1970s as the premier TV magazine. By the end of the decade it had encountered a second rival, an Australian version of the long running US title TV Guide. In 1980, a rationalisation of the TV magazine titles took place. Australian Consolidated Press (ACP) bought out ABC’s share of TV Times. ACP then entered into a joint venture with Southdown Press to amalgamate the three national publications TV Week, TV Times and TV Guide into a single revamped TV Week. Southdown Press would continue to publish TV Week on behalf of both parties. Despite the consolidation of three titles into one, more competition was to come from the two major women’s magazines. The Australian Women’s Weekly launched TV Weekly (which later became TV World) as an insert in May 1980, while rival Woman’s Day launched their own TV listing TV Day in November 1981. TV Day lasted around nine months, while TV World continued as an insert in the Women’s Weekly until that magazine switched to monthly publication in 1983. 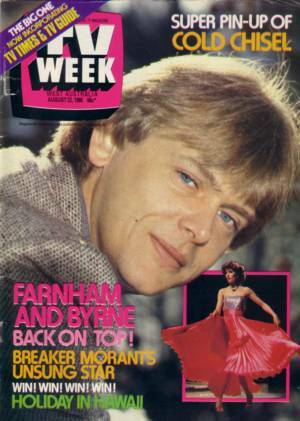 TV Week hit an all-time peak circulation of 850,000 in the mid-1980s which still put it behind other weekly titles such as New Idea and Woman’s Day, but it had a wider demographic appeal than the two rivals. By 1987, the Victorian-based publication TV Scene (the former Listener In-TV) had been handed over to Southdown Press following the media shake-up sparked by Rupert Murdoch’s takeover of the Herald and Weekly Times Group and changing cross media ownership laws. 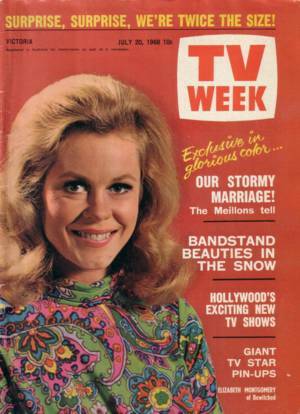 With a circulation of barely 60,000 compared to TV Week’s 800,000, TV Scene was shutdown after 62 years of publication. By the late 1980s and early 1990s, TV Week’s circulation was into steep decline. Newspapers had begun printing ‘freebie’ TV inserts and ‘glossy’ program guides and this additional competition, on top of an already declining and increasingly fragmented marketplace, took many readers away from TV Week, mostly because these guides contained largely the same information, program listings, etc. for no additional cost than that of the newspaper. In 1994, TV Week became the first Australian publication to publish G-Codes in the program listings to enable automatic programming of compatible VCR’s. But circulation continued to fall, also due to the added competition of online TV listings that had appeared by the late 1990s. The magazine has continued into the 21st century with an online presence of its own to supplement the printed version. In June 2002, Kerry Packer’s ACP successfully bought TV Week out of the joint venture arrangement which had been in place since 1980, and took over publishing the title in August 2002. At the same time, Pacific Publications (incorporating the former Southdown Press) launched a new title What’s On Weekly to combat the revamped ACP-owned TV Week. However the transfer of TV Week from the joint venture to ACP was not without controversy. A legal battle over which publication (TV Week or What’s On Weekly) controls the annual Logie Awards was fought as both publishers claimed ownership. ACP claimed the Logie Awards was included in the purchase of the TV Week title, while Pacific Publications claimed the Logies were not included in the transaction and would remain the property of Pacific Publications. A lengthy legal battle followed and ACP was judged to be the legal owner of the Logies, as property associated with TV Week. What’s On Weekly failed to make any impact on TV Week’s circulation and had ceased publication by the end of 2002. I have a copy of the first TV-Radio Week dated 5 Dec 1957. Unlike the front cover on your website, this has the number 399941 printed on a white background on the bottom right of the cover. I this worth anything please? Hi John. That will be a re-print that was published in 1997 for the magazine’s 40th anniversary – the number printed on front was to do with a competition that TV Week was running at the time. Because it is a replica print only approx 15 years old it may not be worth a great deal but I am not able to provide a valuation but similar replicas do appear on Ebay from time to time so you might get an idea of values from there. Mark Cornwall is my name. I am writing a biography of the late Australian actor Frank Thring. Among his many hats, Frank was a columnist for TV WEEK on and off as far as my research tells me, from 1959 through to around 1965. 1. Did Frank continue writing his column for TV WEEK beyond the mid 1960s ? 2. Who was the editor of TV WEEK in the late 1950s and early to mid 1960s? If you could help me in any way I would be very grateful. 1. Yes, Frank Thring did write a review column in TV Week in the 1980s. 2. I don’t have details of the editor of TV Week during that time. You might have some luck contacting TV Week though being so many years ago they may not have details on record. My sisters audition for it and I want to see if I can find this archival footage. I can’t find anything on the Internet so far. Your chances are not good I’m afraid. Please read this page for more information. Hi, I have two hard cover bound issues of TV week,Volume 1, South Australia September 1959 to December 1 1959.The other is Queensland- Northern NSW from December 1963 to December 1964. Do you think they are worth anything?? They may indeed be worth something but I am not in a position to value them you would need to consult someone like a collectibles valuer or dealer to get an idea of a price. However, if you do settle on a price please get in touch! Hi Craig maybe have a look at Ebay. I am doing a write-up for a community newsletter called the Bass Valley News which is distributed throughout South Gippsland and Bass Coast in Victoria. I am looking for a typical weeks tv program of 1957 so I can compare it with a typical week’s program of today’s tv. Can anyone please help? Thanks Ian. Hi Ian. There are lots of Classic TV Guides at this page. I haven’t got a full week for 1957 published at this stage. If you look at The Age on the Google News Archive you should be able to find a week’s worth of programs. I am trying to locate one perhaps two photos of a band I was in during the 70’s that was published in the TV week promoting New Faces. We were finalists. Is there an archive that I can peruse for the photos and if found purchase? I am trying to put together a historical book for our family and friends that involved playing music over the period of the 70s. You could check your state library, they possibly have TV Week in archive on microfilm that you can browse and maybe take a photocopy of any pictures if you find them. I have a copy of the TV radio week 5-11th Dec 1957 is it worth anything? I’m not in a position to provide a valuation but if you do seek a valuation just be sure to confirm if it is a 1957 original or if it is actually a replica that was printed in 1997 for the 40th anniversary. The 1997 replica has a computer-generated code number on the front cover and from memory it has a disclaimer on the contents page that it is a 1997 re-print and not an original. Today, but I have a new copies of 60 years of TV Week magazine in 2017.